So I just finished a 5-year rubber replacement on a 2012. Replaced the fuel pump as well. Now, on a warm day, after full-stop landing and a taxi back to the departure end of the runway, when full power is applied the fuel pressure will drop. From 4-5 psi down to 2 and sometimes down to 0. This generates a low fuel pressure warning (of course). Also, the fuel flow will jump to 10 or 12 gph while the low fuel pressure light is on. This will last for about 10-15 seconds, then the fuel pressure and fuel flow return to normal. I changed fuel pumps, and the same thing happens. Any thoughts? Are you supposed to vent the fuel pressure line or something? Could this be vapor? If it is a VDO sender take a pair of pliers and squeeze the connections on the fuel pressure sender even if you think they are firmly on there. Thanks. I just tried that and it didn't help. Fuel pressure drops briefly after a long, hot engine taxi (minimum throttle) followed by full throttle application (taking off after a full-stop landing and taxi back to departure end of runway). Concurrent with the fuel pressure drop is an rapid brief increase in fuel flow. from a taxi rate of 1 g/h to 10 or 12 gph. This is brief. Maybe 10 seconds. After that, the fuel pressure returns to normal full power pressure (in the mid 4's psi) and the fuel flow drops to the normal WOT of just over 6 gph. Since there are two different sensors involved, (fuel pressure and fuel flow transducer) this leads me to believe that it is an accurate depiction of what is happening. The only thing I can thing of is some kind of fuel vapor building in the line. I just finished my 5 year rubber replacement and I'm wondering if something isn't correct. This is a known issue and is not fixable. The issue is with the fuel pump. 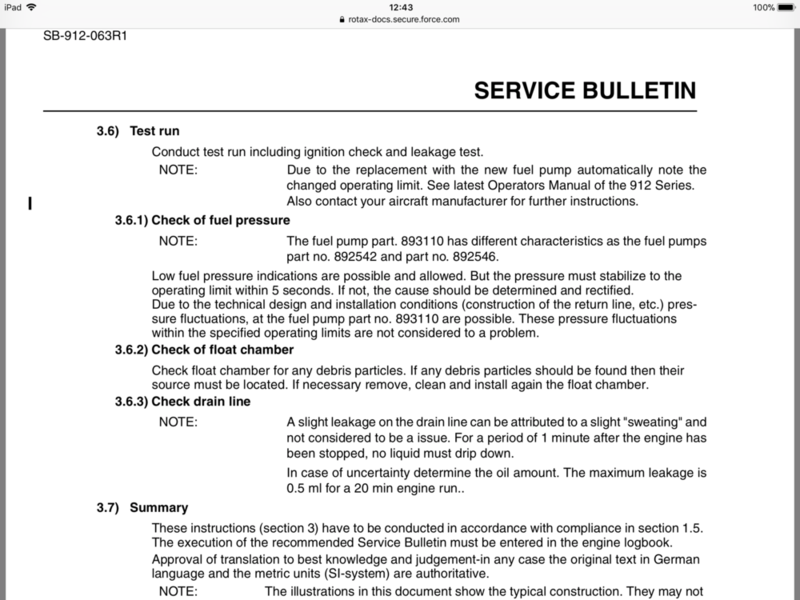 Rotax has released a service bulletin saying the pressure drop is avceptable for 5 seconds. However, since dynons use software filtering, it can cause the warning to persist for a few extra seconds. Thanks Corey. Do you have the SB number? I can’t find it. What bulletin says this drop is normal and okay? Your SB is only revision 1 and there is a revision 2. That low short term pressure is only on installation on first start and many times because of air in the system. This should not be a recurring problem on a regular or extended basis. This paragraph is only after the first install start and says it must stabilize at normal pressure. "Low fuel pressure indications are possible and allowed. But the pressure must stabilize to the operating limit within 5 seconds. If not, the cause should be determined and rectified. Due to the technical design and installation conditions (construction of the return line, etc.) pressure fluctuations, at the fuel pump part no. 893110 are possible. These pressure fluctuations within the specified operating limits are not considered to a problem." Reaccuring pressure fluctuations like what is in the first post is a problem some place. If it isn't rectified by squeezing the connections on the sender and loose wires have been ruled out the just pop in another $30 sender. Many times the sender is the culprit. I always have a couple on hand. Thanks. Here’s another possibility. SI-912-08. If you reuse copper washers and the clearance between the ends of the banjo bolts at the clamp block are insufficient, it can lead to intermittent sensor failure. Banjo bolt end clearance issues can also be caused by over-torqued banjo bolts. Must have minimum of .5mm clearance. I’ll check mine today. Will also clean sensor. I have never had pressure problems on a new pump, but I have seen the high fuel flow before after having the hoses removed from the fuel flow transducer. It has always went away on its own. This has been a problem on all 5 of our CTs since the new pumps. This started when those new AC pumps came out. The old original pump (pierburg?) never had the issue. Mixing in a little avgas resolves it for the most part. But not completely. It occurs on warm days, with the first high throtte setting after having flown and sat for a bit. You can cause it to happen during runup with wide open throttle for a few seconds instead of takeoff, but it's never actually caused a problem other than scaring the sh** out of someone who never saw it before. Roger, I had brought this up with eric tucker during a training course. It is indeed a pump design issue, and some aircraft types are more exaggerated than others. You won't be able to resolve this other than using avgas. Chased this for years before finding that SB. There's no fix. LEAF and Flight Design gets this question ALL THE TIME, it's just something FD's do with certain mogas. How much avgas do you add? A 12v boost pump similar to what is used on low wing aircraft would solve the problem. Older cars also got around the vaporization issue by putting an electric fuel pump closer to the fuel tank (pushing) rather than just having a mechanical pump on the motor. I've got no idea what paper work different countries would require to do this. Also I do want to add: flight design on older models returns the fuel to the gascolator. Rotax these days only accepts a return line to some sort of fuel air separator, such as a header tank or a feed back to the fuel tank. Due to the construction, putting in such a line would be very uneconomical. But I don't doubt it would help. This isn't an issue for the huge majority of CT's. You need to ask yourself why me? None of my guys are having issues and we live in either or both hot or higher elevations. And that's what I'm asking myself! It started after I replaced a 2012 fuel pump. But then I switched the new fuel pump with the same model fuel pump on a 2009 CTLS. Same thing happened. Also, the weather has just warmed up. Perhaps the Maverick gas station where I'm getting my 91 octane auto fuel is still using winter blend fuel. I know that a local new RV-12 is having some vapor lock problems too. I'm putting in a new sensor. It should be in in a few days. Also, I checked the clearance on the banjo bolts at the clamp block. I'm already using the thick washers (used and re-heated/quenched to soften they still measure 1.28mm as opposed to the .8mm washers that cause that problem.) I've checked all of the fuel system except removing and inspecting the transducer. Maybe I'll do that. I suppose something could be partially blocking the transducer. You have a different fuel formulation than we do in Ohio. Ohio is really lax on fuel quality. I bet if you gave out some Ohio mogas, you'd have everyone lined up around your shop complaining about the issue. Again, I fought with this issue for years, and every friggin CT we have has this problem. It's probably a fuel vapor issue at its core, but something with the way Flight Designs are constructed that makes the issue worse. The hotter the day, the more pronounced the issue, but it has never affected flight. It just throws an alarm at the first full power operation after engine start. The issue is non-existent on cold days. Adding a little avgas largely puts a stop to the issue. With pure avgas, the issue doesn't show at all. Not really sure if this helps but Larry's CTLSi has operated out of Arizona in really hot conditions and high altitudes and has had zero problems. The difference may be solved with fuel injection? Thoughts? Fuel injected rotax has a very different design and purges air in the system. it has a fuel pump that constantly circulates fuel from the header tank, through a fuel filter, through the fuel rail, and back to the header tank where air and fuel separates. The top of the header has a small line for air to escape back to the left fuel tank. The carb designs do not do this. Identical incident..... Why did it pass Run Up 2 times? Did you full power the runup? I would run it and even fly it a few times. Most likely air in the system. If it wasn't having an issue before the hose change this is the most likely answer unless you tugged on some wire too hard. Usually a bad connection like at the sender causes high fuel pressure alarms. I was in the aircraft that Sid is describing when it first happened. We did the standard by the book run-up, I think it was 4K RPM. First take off we got the audio "bitchin' betty" about low fuel pressure. We did a high speed abort. 2nd time we did a higher RPM runup and it appeared fine. This time, I stared at the fuel pressure reading while the instructor handled the take off. It started off in the green, then about 1/3 of the way down the runway went in to the yellow, by about halfway down the runway it moved in to the red and we were getting the Audio alert of low fuel pressure. We braked and taxied off the runway. Once we were down to lower RPM and off the runway, the fuel pressure returned to normal. Put a mechanical gunge in line and try again to confirm it is a real low pressure and not the sender or anything else. I have to do that tomorrow to check an abnormally high oil pressure and fuel pressure. Great news. Based on a tip from someone else who has had this problem, I checked the orifice on the return fuel line to the gascolator. Sure enough, it was partially blocked with a tiny bit of fuel line debris from the recent rubber replacement. To find it, I had to screw the restrictor out of the barb connection and there it was. I'll let you know how it works on a hot day, but I think that was the problem. Corey, you might want to check this on your CTs that have been showing this behavior on hot days.